What is the role of diplomacy in international relationships today? 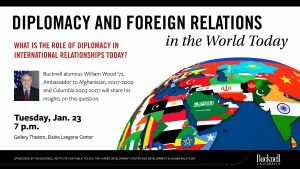 Bucknell alumnus William Wood ’72, Ambassador to Afghanistan, 2007-2009 and Columbia 2003-2007 will share his insights on this question. Please join us on Tuesday, January 23rd at 7 p.m. in the Forum in the Gallery Theatre, Elaine Langone Center.